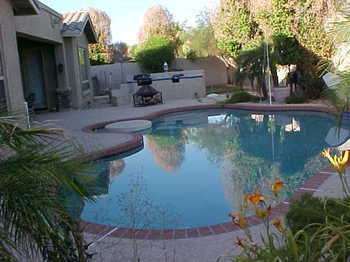 BlogArizona.com - An Arizona Real Estate Blog: Buying a Home with a Swimming Pool? Buying a Home with a Swimming Pool? Safety - Even if you do NOT have small children yourself, safety is always a concern when you have a swimming pool. You might have friends and/or relatives with children, or you might just have to worry about a neighbor kid wandering in your backyard. Be sure to consider the cost of adding a fence if you're buying a home with an unfenced pool. Also, there's more to Arizona's Pool Barrier Laws than just having a fence, so be sure to check and comply with local rules. Financial Cost - You should expect both planned and unplanned repairs when you own a pool. Over time, pumps stop working and vacuum equipment wears out. In addition to the repair and maintenance costs, there will also be chemicals to buy, along with increased water and electric bills. Time and effort to maintain - Even a so-called 'self-cleaning' pool takes time and effort to maintain, especially during the Arizona monsoon season! So be sure you're willing to commit the time and effort necessary to properly maintain a pool. An improperly maintained swimming pool will be seen as a liability to potential buyers. Here's a more detailed article about swimming pool maintenance (written by my favorite home inspector, of course!). And if you don't have a swimming pool at home but want to cool off over the summer, most of the Valley's junior high schools have swimming pools that are open to the public during the summer. Here's a list of swimming pools at Mesa junior high schools. In my market, Salt Lake City, a pool usually limites the "buyers pool" for a home significantly. Our summer season is relatively short and makes the cost/benefit of a pool more questionable.